The Courtyards at Jetton in Cornelius, North Carolina is an active lifestyle community that is comprised of low-maintenance homes. Residents enjoy quality-built homes in a convenient location. The Courtyards at Jetton is a welcoming community that embraces the great outdoors and North Carolina’s mild four-season climate. Although there is no community clubhouse, residents can still remain socially and physically active outdoors. A picnic area lets residents host events or enjoy quiet time with some fresh air. During the warmer months you’ll often find residents strolling along the scenic pond located at the rear of the community. Epcon Communities opened The Courtyards at Jetton in 2014 and plans to build 25 single-family homes upon completion. There are three models that include two bedrooms, two bathrooms, and an attached two-and-a-half-car garage. These homes range in size from 1,519 to 2,769 square feet. Homebuyers have the option to customize their plan with an optional second-story loft that includes an extra bathroom and living space for guests. Other included features are granite countertops and stainless steel appliances in the kitchen and hardwood floors throughout the living room, dining room, and kitchen. Residents of The Courtyards at Jetton enjoy a carefree lifestyle where they can come and go as they please. Homeowners never have to worry about mowing, landscaping, exterior-building maintenance, and driveway care because all these services are provided. With less time worrying about the hassles of exterior maintenance, homeowners have more time to explore all the area has to offer. 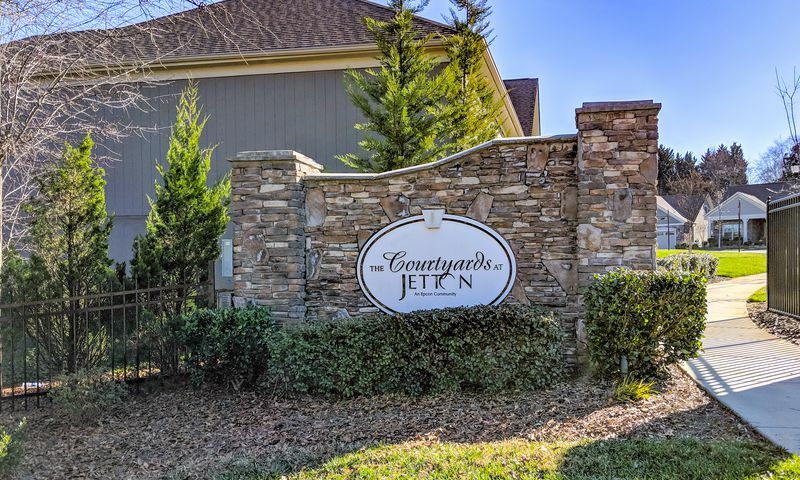 The Courtyards at Jetton is located in Cornelius, about 20 miles north of Charlotte, NC. With easy access to major roadways like Interstate 77 and Interstate 485, traveling to Charlotte Douglas International Airport is a simple 40-minute commute. Closer to home, there are plenty of opportunities for outdoor recreation at Jetton Park, Ramsey Creek County Park, and Lake Norman. Down the street located along Jetton Road and West Catawba Avenue there are shops, restaurants, and pharmacies. The Jetton Village Shoppes includes a Harris Teeter supermarket as well as banks and a variety of dining options. Baby Boomers will appreciate all that the great location of The Courtyards at Jetton offers in Central North Carolina. Check back soon for more information on the lifestyle in The Courtyards at Jetton. There are three home models that range in size from 1,519 to 2,769 square feet. Homebuyers can select a single-family home that has two bedrooms, two bathrooms, and an attached two-and-a-half car garage. An optional second-story loft includes extra living space for guests and an additional bathroom. 55places.com is not affiliated with the developer(s) or homeowners association of The Courtyards at Jetton. The information you submit is distributed to a 55places.com Partner Agent, who is a licensed real estate agent. The information regarding The Courtyards at Jetton has not been verified or approved by the developer or homeowners association. Please verify all information prior to purchasing. 55places.com is not responsible for any errors regarding the information displayed on this website.